Beach wedding hairstyles for 2015 shouldn't be complicated especially with the trending natural hairstyles. The first thing is make beach waves that are awesome for any place and any weather. 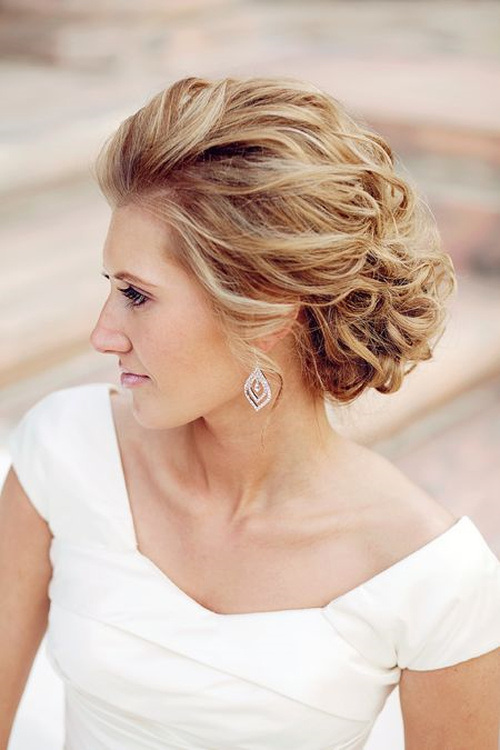 Hair trends 2015 for weddings on the beach can offer relaxed loose hairstyles, or cute messy updos. It's also important to have some cute hair accessories like flowers or seashells. Even you short haircut can become festive for the beach party, you just need to choose the right flower hair accessory, and you can even make an updo and add a sea star on your short hair. Shaggy bob haircut is one of the trending styles, especially after we saw Emma Stone with her cute red haircut. For beach wedding, you do not need to style the bob style for long, just make a cute small side fishtail and enjoy it. For long hairstyles there is always a solution. You can have very cute bridal hairstyles using braids. It can a whole crown braid, or just braided band, it can be small messy braids and strips reminding of Greek goddesses. White flower hair accessories, cute low bun, and not very neat long bangs will make you look like an angel in the sunlight as if just thrown out by the sea waves. If you are certain to hold the wedding ceremony on the beach, then mind that the wind and the sun will affect your hairstyles for bride. So for updos choose messy styles from the very beginning, cause they won't look spoiled afterwards. Beach doesn't' mean inaccurate and careless, you can still look aristocratic and feminine. Compose an easy updo hairstyle and a veil on you hair, it will look awesome.